Hello! It's been a pretty quiet month on my blog, as I haven't been home much this month. My son has lots of swim meets this month and I was in Phoenix for six days for Creativation 2018. So, today I have a quick no-line coloring card and video to share. 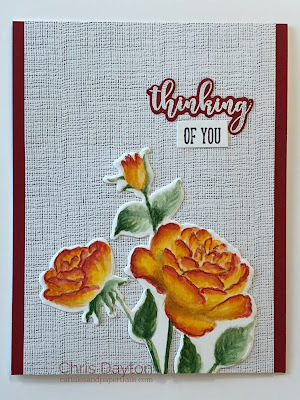 I came back from Phoenix to find this new Gina K. Designs Stamp TV Kit: Hearts and Flowers in my mailbox, and wow! This kit is loaded with beautiful images and sentiments. Today I am using this gorgeous rose image from the Tropical Blooms set from the kit. 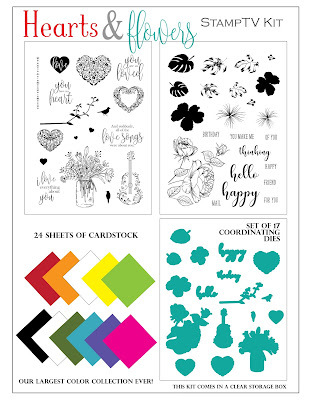 I stamped multiple times with Versamark ink using my original MISTI onto Artist's Choice cardstock. The Versamark left a very faint image for me to no-line color. I used Copic Markers to put a base color down first, then used Faber Castell Polychromos pencils over the top. The You Tube video is linked below.